Normally an Orthodox Church is divided into three distinct parts: narthex (entry way); nave (main body); and Altar. The narthex symbolizes the created world, made and blessed by God in the beginning as “very good,” but now fallen and alienated from the Source of Life. The nave constitutes the Church Herself, the Mystical Body of Christ made up of Her members both past, present, and yet to come. The Altar area, joined to the nave by an icon screen (iconostasis ) shows the Kingdom of God—the Kingdom “to come,” but in Christ and the Church a Reality already accessible to the faithful. the west-to-east axis of the church building constitutes the progression of all Christian life: World -> Church -> Kingdom. Across the iconostasis there is also, on the north-to-south axis, another theme. The central, or “Royal” doors, lead from the nave to the Altar Table, the Throne of God. On the left (northern) side of these doors is an icon of the Incarnation, the first coming of Christ as a Child born of the Virgin Mary. On the right side of the Doors is an icon of Christ as He will appear on the “Last Day,” in glory. It is here between the first and second comings of Christ that the Church gathers and meets Him Who promised to be with us always. In front of the Royal Doors the faithful receive the Eucharist, partake of the Messianic Banquet to come even here and now, and are united to Christ. Before the Doors the two axes intersect—the world, Church, and Kingdom to come encounter the Lord Jesus Christ Who came, IS, and will come again. Icons (Greek: image) on the walls of the church depict scenes from the Holy Gospel, Sacred Church history, or Saints. Icons are also placed on stands in the church for veneration by the faithful. Icons are not merely decorative art. They are neither subjective nor sentimental, but a window into the spiritual world. Veneration is not to the paint or wood of an icon but to that other world from which shines Christ Himself, the “light that lightens every man that comes into the world” (John 1). 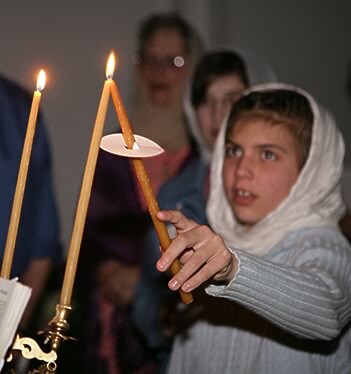 Candles are used extensively in Orthodox worship, on the Altar and by icons, signifying the light of Truth given by the One that illuminates the world with spiritual radiance. Candles are part of our offering to God, symbolizing our soul’s burning love for God and His Church. 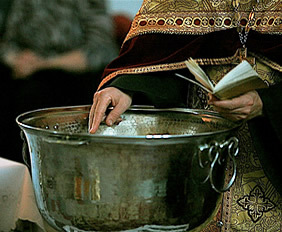 Pews are not traditionally found in Orthodox churches. We stand, as much as we are able, before the living God during Services as humble and reverent participants in worship and not mere observers.